Anders and I had our friends, Ryan and Ilona, over for Thanksgiving this year, and it was the first time that we have ever been in charge of the entire dinner. Anders and I tackled 7 dishes plus the turkey, and I have to admit...due to my crazy organization skills, everything went off smoothly. 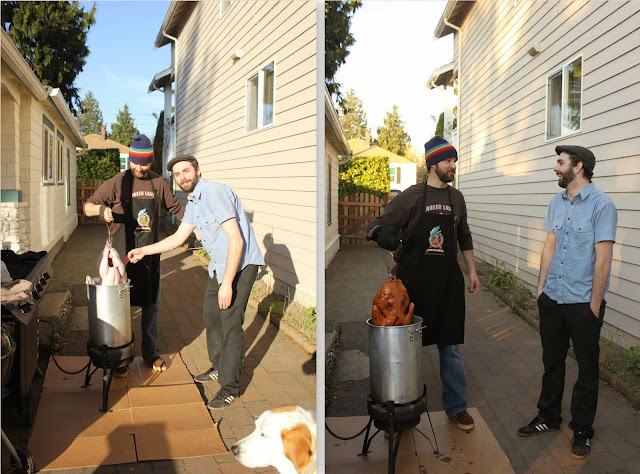 This year, I'm so thankful for my husband, who can deep fry a turkey without breaking a sweat, and for our new kitchen where we can actually host a meal! Best holiday ever. The only way to have a foul-proof Thanksgiving is to have a schedule. It speaks to my organized, slightly OCD, heart. The only kind of injection I stand for. Looks delsih! I can't believe you could even photograph the turkey injector!